Today we met up with the in-laws for a late lunch at the Flying Biscuit. FIL showed off his new iPhone and I managed not to cry in envy. MIL got a new cell phone too, just a regular one, but one with a camera. At one point we all had our camera phones out snapping pics of each other like a bunch of techno geeks. After lunch we went over to Starbucks to continue our conversation over Spiced Pumpkin frappucinos. Yum. We sorted out plans for the holidays (this year they get us for Thanksgiving and Christmas Eve) and I got some gift ideas for the hard to buy relatives. We left the in-laws and CSP & I stopped at the new Aldi in town to check it out. Neither of us had never been to an Aldi before. Aldi and my beloved Trader Joe’s are owned by the same company. I love the buggy system. You pay 25 cents for a buggy, but you get the quarter back when you return the buggy. No stray buggies slamming into cars in the parking lot. Genius. Also, you have to buy your bags. Or, bring them from home like we do. We use Baggu bags and I just love them. I love that Aldi doesn’t just give out bags. I think all stores should follow their lead. Eliminate plastic bags all together. Their prices are really low. The store is smaller than what we’re used to, clean, and organized. We did have to stop in at Bloom for a couple of things before going home. We went into the beer cave so CSP could pick up a 6 pack and I saw the grossest thing! It’s Budweiser mixed with Clamato juice. So… you have beer (gag) mixed with tomato and clam juice (bigger gag). First of all, it’s the juice of an animal. Would you drink cow or duck juice? Like, for refreshment? Over ice or in a can? How about pork juice? Bleh. They call it the Chelada. I call it canned vomit. « Winner, winner, chicken dinner! Not a big fan of clamato, like, at all. But beer. Yeah, love the stuff. Beer with lemon. Beer with lime. Beer with Tabasco. Beer all by it’s little self. Ok, I’m gonna have to side with you — that drink sounds horrible!! Ha! My mom used to drink her beer with Clamato. ALL. THE. TIME. I thought it was gross too but a month or so after she died, we heard an antique store owner talking about drinking beer with Clamato and now this! She would’ve been a freakin’ millionaire! Actually, I think it started in Mexico for some reason. Yeah I thought of milk myself. LOOL. Does your family and CSP’s ever do the holidays together? 1. we went to ALDI this weekend. 2. We saw the clamato beer too. and both of us gagged big time also. 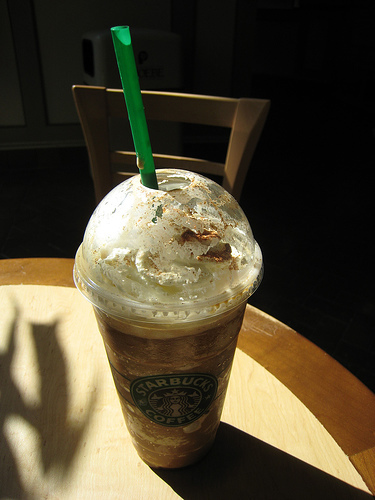 I must run to Starbucks tomorrow for one of them Yummy Pumpkin frappachinoes! Slirp! At first I was going to say that a drink that wierd would probably only be for pregnant women with cravings. Then I realized that maybe beer wasnt the best choice for pregnant women. lol. We love Aldi in our house. Cheap groceries! I did a whole weeks shopping for a family of 6 for under $100 once. But up where I live we can’t get alcohol in food stores, a very big hassel if you ask me. That whole clamato beer makes me want to vomit! OK maybe it’s a northern thing but we mix beer and clamato juice up here. It’s called a Red Eye (not MY personal favorite). Also, practically every grocery store around has ‘the buggy system’, since I was a kid.